AccaBackers is a tool which helps you generate maximum profits from ACCA Insurance offers by compiling the best-value legs for your accumulator. ACCA Insurance offers generally credit you with a free bet up to the value of your stake if one of the legs in your accumulator let you down. This allows you to occasionally lock in a profit by laying your accumulator and leveraging the value of the free bet. There are a few different methods you can use to profit from ACCA Insurance offers, some may return a small profit with little to no risk while others may return a higher profit but come with greater risk. However, providing there is a positive expected value for your bet, you will make an overall profit over time. AccaBackers helps you identify these +EV opportunities and shows you exactly how to profit from them. 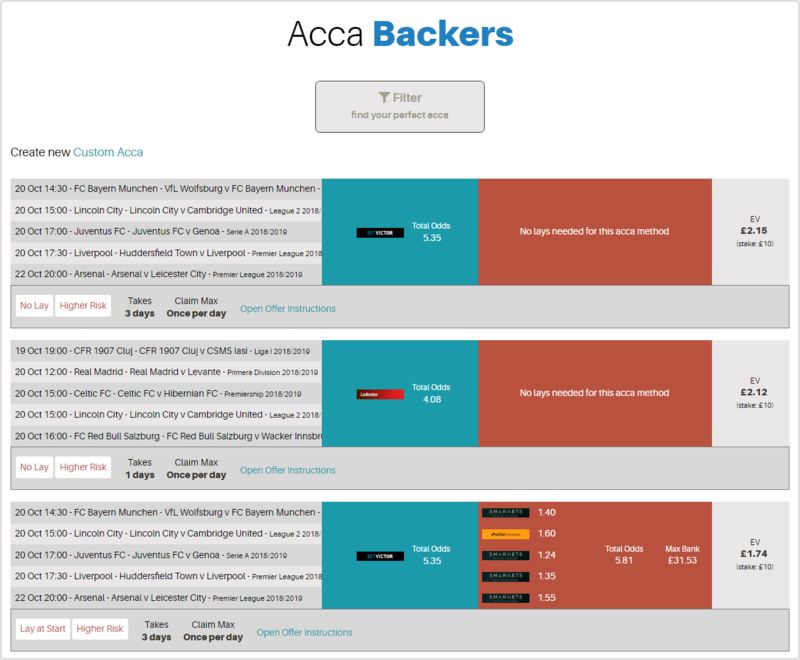 AccaBackers is preconfigured to only display ACCAs which meet the criteria of each bookmaker offer. For example, if the Ladbrokes ACCA Insurance offer requires you to place an ACCA where all legs have to be at odds of 1.2 or greater and combined odds of 3.0 or greater, AccaBackers would not include legs which fall outside of this criteria. After filtering and selecting an ACCA which has a positive Expected Value, you are able to view the ideal lay stakes (should laying be necessary) for each leg of your accumulator. From here you are able to swap legs of your ACCA should you wish. You may consider doing this if you want all of the legs of your accumulator to be in major leagues to make your bet look more natural to the bookmaker. By doing so, the lay odds for each leg will update and the new EV will be displayed. Depending on which lay method you use, the profit you will make from your ACCA will vary depending on the results of the legs as they play out. After you are happy with your ACCA you can save it which will transfer it to your saved ACCAs list. You can then mark the result of each leg of your accumulator which will in turn, update the ideal lay stakes for the next leg to be played. By doing so, you are always guaranteed to extract the maximum profit from your accumulator based on each legs result. 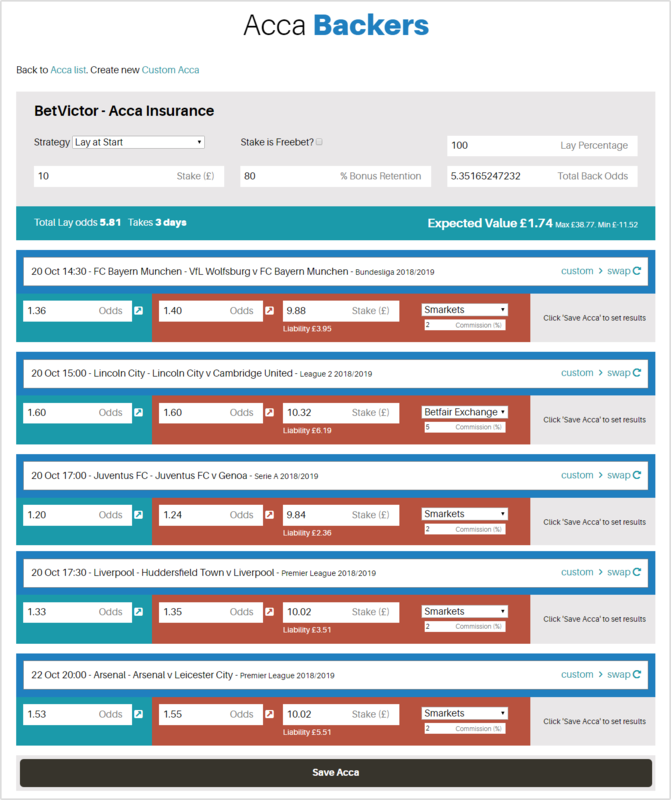 AccaBackers is a tool which is available to all ProfitSquad members and can help you generate more profit from ACCA Insurance offers as well as save you a considerable amount of time in finding legs for your ACCA.